Christopher Hayes is the Director of Real Estate Management with Accordia Realty Ventures, who works directly with the Principals of the organization to ensure that objectives are being met as well as anticipating and responding to the Company’s and Clients needs across their investment portfolio. Chris’ primary responsibilities include operational oversight of Accordia’s entire real estate portfolio consisting of nearly 2,000,000 SF of class A office, industrial/flex, and retail space. Supervising the management team to ensure optimum performance; performing inspections of properties; coordinating marketing and leasing of properties; and overseeing the collection of rent, payment of expenses, and compliance with lease terms. In this position, Chris also oversees the planning, budgeting and control of operating and capital expenditures. This includes being directly involved in the project management and budgeting of all tenant improvement, capital investment, redevelopment, and ground up development initiatives for the company. He prepares annual operating budgets, forecasts, management plans, monthly financial reports, and variance reports. Chris is also actively involved in all acquisition and dispositions for the company where he supports the principals with underwriting, debt placement and due diligence. 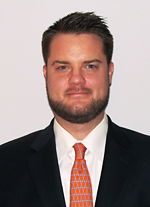 Chris joined Accordia Realty Ventures in 2011 as a Real Estate Manager. Prior to Accordia he was a Property Manager at Grubb & Ellis where he was actively managing Accordia’s portfolio since 2008. Chris began his real estate career at CBRE in 2006 where he worked in the Market Research Department before being recruited by the real estate management group where he assisted in managing 2.5 Million SF of class A industrial warehouse/flex space throughout the tri-state area as well as a combined 200,000 SF of both class A office and retail space in New Jersey. He earned his undergraduate degree in political science from Hartwick College and is currently pursuing his RPA designation.